In our previous post we reported that the Refugee Council USA (RCUSA) apparently played a role in getting those 14 Senators signed on to a letter urging Obama to open the flood gates to 65,000 Syrian refugees before his term in office expires! Here are the members which pay “dues” to belong to this lobbying arm for the resettlement industry. Chairmanship rotates and the present chair is Anastasia Brown of the US Conference of Catholic Bishops, here. Brown is the contractor/lobbyist I observed who asked that we resettle more Rohingya Muslims here in 2013. 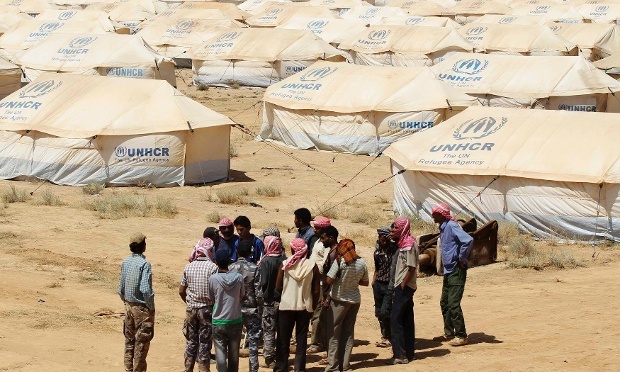 Refugee Council USA is chaired by the executives of member agencies on a rotating basis and has two full time staff. To concerned citizens! Do not get discouraged when you see the lobbying power and the money behind the refugee resettlement industry and know that you are having an impact! You have every right to know every detail about who is coming to your towns and what these unelected advocacy groups are planning! Update May 24th: Be sure to see Leo Hohmann’s good article at World Net Daily on this newest push for a mass infusion of Syrians into the US. Also, on this Sunday morning is your church indirectly supporting the resettlement of 65,000 mostly Muslim Syrians to America? Click here. Funny that Durban doesn’t list the other signatures on the letter in his press release. In order to see them, go here, to the RCUSA website. One must assume that by mentioning the 65,000 desired by the refugee resettlement contractors (via RCUSA), all 14 are on board with the number! Endnote: I have more to say and may edit this post or add a new one, just wanted to get this news posted before I lose internet connection again today. Editor’s note: I have so much news to post, but internet connection is dropping today. If I disappear, know that I am frustrated about not getting it to you or posting your comments! Or, answering your many e-mails. Since everyone is talking about the number of Syrians admitted to the US as refugees (see yesterday’s comments by House Homeland Security Committee chairman), I thought it was time to update the numbers. When I search the data base for Syrians I go back to calendar year 2012 (1/1/2012) so as to include those who might have gotten here right after the recent conflict began in 2011 (thus numbers you see published may vary some depending on when the source began counting). I reported on May 1 that we had admitted 815 Syrians (92% Muslim) from 1/1/2012 to 5/1/2015. * 843 Syrian refugees have been sent to your towns and cities. That works out to 92% Muslim! By the way, if you are saying to yourself, heck, there are more Syrians in my town than this small number, remember that there are other legal avenues for entry. Syrians already in the US were granted Temporary Protected Status (TPS) in 2012 by the Obama Administration and a reader recently shared with me that his US Senator says there are over 11,000 Syrians (who were already in the country when the conflict began) and are thus eligible for TPS. By the way, it was our usual suspects, the US State Department resettlement contractors who lobbied, along with Arab groups, for the TPS designation. Those same contractors want us to take 65,000 Syrians by the end of 2016 and the UNHCR has 11,000 picked out for us this year.